The project is the biggest road project ever undertaken in Northern Ireland. 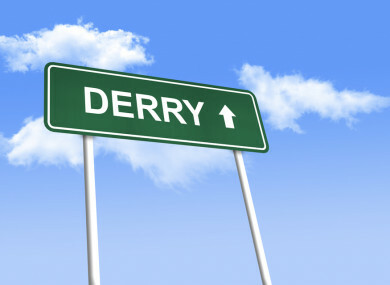 CONSTRUCTION OF THE A5 motorway which will connect Dublin and the border counties to Derry and Letterkenny will begin this year. Taoiseach Leo Varadkar said there will be a big focus on regional development this year, to ensure all parts of the country share in the economic recovery, he said. “There will be a focus on the north and the All-Island economy, improving infrastructure over the next ten years building a motorway to connect Dublin and the border counties to Derry and Letterkenny and also examining the Dublin to Belfast rail line,” said Varadkar. The project is the biggest road project ever undertaken in Northern Ireland. The roadway has been delayed for a number of years due to questions around funding during the recession, consultations and legal challenges. In 2015, British and Irish governments, and the main political parties in the North, committed to providing funding of £50 million for the A5 Western Transport Corridor serving the North West and also committed an additional £25m to the project. Subsequently, a group, co-chaired by senior officials from the Department of Infrastructure Northern Ireland and the Department of the Taoiseach, was established to monitor progress in taking the project forward. The stakeholder group has met seven times to date, and at the end of November a decision to proceed with the A5 motorway was reached and for work to start in 2018. As part of the work of the senior officials group, the Department of the Taoiseach has been in contact at official level with key stakeholders in the A5 project including the Department of Infrastructure Northern Ireland, Derry City and Strabane District Council and other UK government officials. Phase one of the project is to begin this year, however, there are concerns that the stalemate in establishing the Northern Ireland Executive could hold up the project. The Minister for Finance and Public Expenditure said the final decision in respect of the A5 alignment is a matter for the Northern Ireland authorities. Email “Construction of motorway to connect Dublin to Derry to begin this year”. Feedback on “Construction of motorway to connect Dublin to Derry to begin this year”.